Pentax *istDS Silver introduction : Pentax is pleased to announce the addition of a silver-coloured version to the popular Pentax *istDS digital SLR camera. 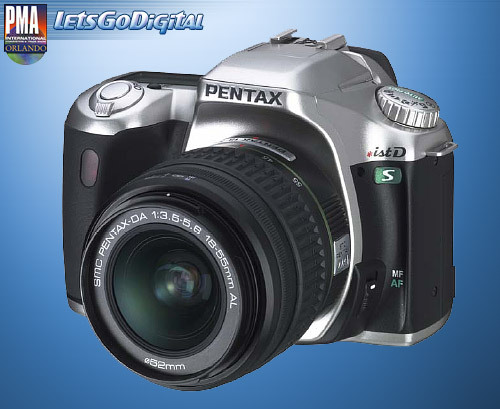 Named the Pentax *istDS Silver, it offers the same user-friendly features and high-standard specifications as the original black-coloured version, except for its body color. With a choice of two attractive colours, the Pentax Silver now extends outstanding manoeuvrability, simplified operations and an affordable price to a broader range of quality-conscious digital SLR users. Attractive silver-coloured body: In response to the request from many enthusiastic consumers, Pentax designed a fashionable silver-coloured body for the new *istDS Silver, offering a choice of a body color between silver and black to accommodate individual preferences and assure greater color conformity with lenses. Compact, go-anywhere design: Featuring a super-compact, ultra-lightweight body, the Pentax *istDS Silver offers outstanding portability to accompany the user anywhere. The combination of many downsizing technologies, including a high-rigidity stainless-steel chassis, multi-layered electronic circuit boards and high-density packaging technology, resulted in this extremely portable body, measuring only 125mm wide, 92.5mm high and 66mm thick and weighing a mere 505 grams without batteries and SD memory card. High-definition, maximum-gradation images with 6.1 effective Megapixels : Thanks to its large, high-performance CCD image sensor, the Pentax Silver version offers 6.1 effective Megapixels. Coupled with Pentax's original image processing technology, it produces high-definition images rich in gradation and saturation. Compatibility with Pentax interchangeable lenses : The Pentax *istDS Silver offers the outstanding benefit of lens iinterchangeability, allowing the user to take advantage of a wide selection of existing Pentax interchangeable lenses to deal with diversified subjects and applications. Large color LCD monitor: Thanks to a high-precision 2.0-inch color LCD monitor offering approximately 210,000 pixels, the Pentax *istDS Silver makes it quick and effortless to review recorded images and read menus. 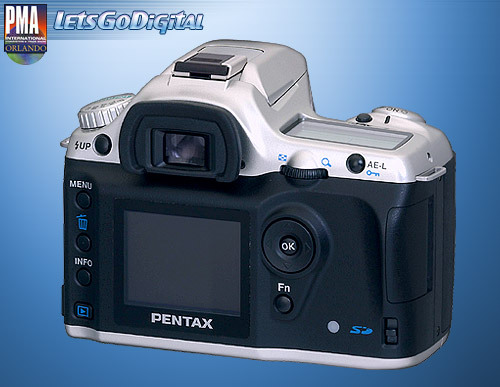 Large LCD data panel: The Pentax *ist DS Silver features a large, easy-to-read LCD data panel on the top panel to allow easy, at-a-glance confirmation of the camera’s operational status and various settings. User-friendly automatic operations: The Pentax *istDS Silver is equipped to make camera operations simple and effortless for the user. Its innovative Auto Picture mode automatically and instantly selects the optimum combination of exposure settings for a given subject or situation, including shutter speed, aperture, white balance, saturation, contrast, and intensity of edges. The built-in auto flash automatically pops up in dimly lit or backlit situations. Simple, accessible operation system: From the multi-function four-way controller to the responsive electronic select dial and the large, easy-to-use mode dial, all switches and dials are efficiently and functionally laid out around the Pentax *istDS Silver’s compact body to assure smooth, fingertip control. High-precision 16-segment multi-pattern metering: The *istDS Silver incorporates an advanced 16-segment metering system to assure high-precision light measurement, even under complicated lighting conditions. Center-weighted metering and spot metering are also available to meet specialized applications. High-accuracy 11-point AF sensor: The Pentax Silver digital SLR features the sophisticated SAFOX VIII AF system incorporating 11 AF sensors (nine of them constituting a cross-type wide-area sensor grid in the middle). It not only offers accurate, pinpoint auto focusing, but also allows the user to select one of the sensors to accommodate a specific image composition. Superimposed AF sensor point indication: The selected AF sensor point is highlighted in red in the viewfinder for easy visual confirmation. 1/4000-second high-speed shutter: The Pentax *istDS Silver features a high-speed shutter unit with a top speed of 1/4000 second and a top synchronization speed of 1/180 second to assure greater visual creativity. High-speed consecutive shooting: The Pentax *istDS Silver records up to 8 images consecutively at a speed of approximately 2.8 frames per second, allowing the user to capture a series of the subject’s action or movement. SD memory card compatibility: The Pentax *istDS Silver uses the widely available SD memory card as its storage media, not only assuring high-speed recording and readout of image data, but also contributing to the downsizing of the camera body.